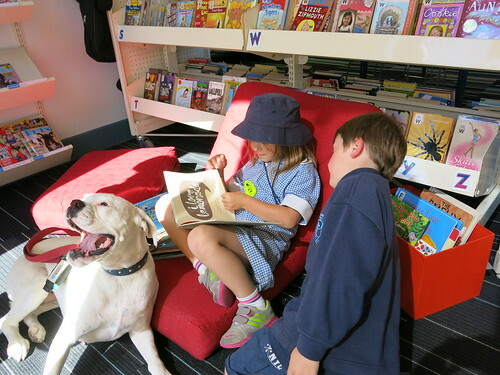 Christchurch City Libraries Reading to Dogs programme is designed to provide a relaxed, non-threatening atmosphere which encourages children to practice their reading skills and develop a love of reading. The programme uses dogs who are now the beloved pets of the Christchurch City Council Animal Control team. These furry friends have all been trained and tested for health, safety and temperament. Reading aloud is critical when children are learning. However, many children have difficulties reading and become self conscious when reading in front of their peers. Libraries and schools around the world have found that by sitting down and reading to a friendly dog, a child’s fear of being judged or laughed at ‘over mistakes’ disappears. Over time, the child’s reading ability and self-confidence improves and they begin to associate reading with a pleasant experience. See photos of kids reading to Noddy.